In recent years, hard floor coverings – wood, stone, linoleum – have become more prominent, while carpets have lost popularity. However, with regard to impact sound level and sound absorption the properties of textile floor coverings cannot be underestimated. Together with other surfaces in a room, carpets can decisively contribute to create a high degree of comfort and at the same time confidentiality. The demand for tranquility and comfort associated with modern design have made architects and developers increase their focus on the possibilities for sound absorption. The less conspicuous the absorbing material is the better. More sound absorption means less sound propagation in the room and thereby less noise. In cooperation with the international well known architects and designers and the acoustician Dr. Christian Nocke / Akustikbüro Oldenburg Ruckstuhl searched for solutions which meet the latest developments in both room acoustics and product design. They all had the vision of creating not only a high tech acoustical piece, but also beautifully designed and functional elements which are equally useful for interior design purposes. Therefore, the collections PANNELLO and SILENTO have been developed. refered to. No responsibility is taken for the room acoustic design of the room under survey. Rooms with full acoustic ceiling might have problems that cannot be solved with Pannello/Silento sound absorbers. Rooms with acoustically disadvanagous shapes (circles, ellipses, parallel reflecting walls) may have deficits that require a sophisticated room acoustic design. Functionality and decoration for all kinds of inner space – inspired by the school satchel. In the hanging design variant, SILENTO is suspended from the ceiling with a fine wire. Silento – inspired by the design of a school satchel, and consisting of two identical elements joined by belts, resulting in rigidity and efficiency. Boundaries with purified lines and a comfortable look, these large surfaces seem to hover in the air, coping easily with spaces and sounds and filling the environment with a sense of wellbeing. The panels are obtainable in three different sizes. They can be hung horizontally in isolation, or else lined up in a horizontal or vertical series. This way you can create combinations that are suitable for all kinds of spaces and acoustic requirements. SILENTO is available in over 45 colours, with which 6 strap colours can be combined. For the Silento (Fig. 1) the test report quotes the frequency dependent sound absorption data as well as single number ratings. For the Silento (Fig. 2) the equivalent sound absorption area of one element is given according to ISO 354. Flame resistance CFL-S1 for the following areas: offices, seminar and conference rooms, lounges, cafetierias, waiting rooms, recreation areas and all other rooms where generally speaking no more than 100 persons will be accommodated. Available in two different heights, and in any length you choose. It can also be installed in the corner of a room. Pannello Tavola is easy to set up on any desk, and also serves as a visual screen. Besides excellent sound absorption features additional functions include: The panels serve as projection screens, pinboards, or room structuring elements. A comfortable, secluded atmosphere is created; and private, live-and-work-situations as well as large professional areas are considerably improved in terms of both optical design and acoustic comfort. The dimension, surface material, and details in style allow a multifunctional application with regard to structuring rooms and design of working environments. The surface made of pure wool felt in subdued colours produces a warm atmosphere. The unobtrusive but expressive style and the different ways of assembly allow the setting of Pannello a variety of rooms. the same time highly effective, as it absorbs sound on both sides. This version of Pannello, hanging freely in space, makes it possible to divide a room up into zones. 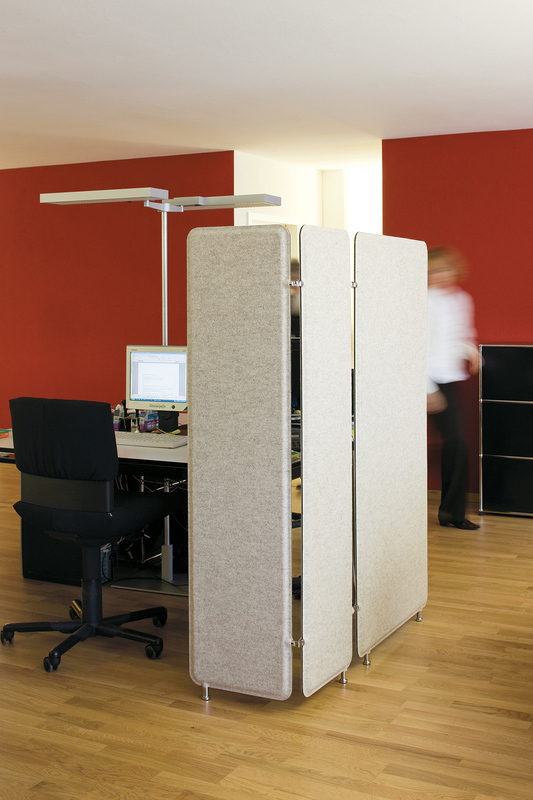 This screens out sound and provides privacy in visual terms as well. If the acoustic properties of a room change, or you want to divide it up differently, just move the Pannellos to a different position. Pannello Paravent stands on two legs, can be enlarged at discretion and is designed for use as an optical room partition. For the Pannello murale (Fig. 3) the test report quotes the frequency dependent sound absorption data as well as single number ratings. For the Pannello supporto (Fig. 4) the equivalent sound absorption area of one element is given according to ISO 354. For Pannello semplice, on the other hand, the sound absorption coefficient is listed together with the associated ratings (Fig. 5). Pannello comes in two different flame resistance variants. This is based on the European standards EN 13501 and EN 1021. These standards apply to all EU countries and Switzerland. It may however be the case that some countries have more stringent requirements. In such cases we would recommend the “high performance” variant. Flame resistance EFL for the following areas: offices, seminar and conference rooms, lounges, cafetierias, waiting rooms, recreation areas and all other rooms where generally speaking no more than 100 persons will be accommodated. Flame resistance BFL-S1 for escape route requirements: Emergency exit corridors, stairwells, highrise buildings and rooms where generally speaking no more than 100 persons will be accommodated.